DJ Saxy. Hers was a story I asked to tell months ago; and then life happened to me. Wave after wave of circumstances in unchartered waters crashed against every facet of my being. Every time I tried to open my mouth to gasp for air, drowning waters overtook me. As I began to get my bearings together I was able to remember unfinished conversations. My conversation with DJ Saxy was one that I wanted to finish. Life had forced me to leave our warm exchanges mid-sentence. She was headed out on tour as a DJ for Carnival Cruise Lines and that bought me some time. She’s been patient, as her’s I felt, was an important journey to share. After having graciously accepted my private apologies, which she didn’t feel were necessary; I wanted to publicly apologize as well. Thank you again for your patience DJ Saxy, let’s get this story told. We worked together for the first time as co-hosts on GrindHard Radio’s Radio Divas talk show this past season. Besides being fun, articulate and mad cool; she is extremely knowledgeable about the music industry and selflessly shares from a global perspective. In getting to know her better, I quickly learned more than music had captured her heart. 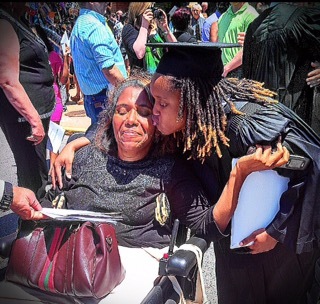 Her mother’s battle with Multiple Sclerosis weighed heavily on her. Using her platform as an internationally renowned DJ to help raise awareness about the disease, only increased my admiration and respect for her. The name DJ Saxy came from the instrument. I played the saxophone for several Blues groups and artists while I was in college. I even had a chance to play for Blues singer Bobby Rush! I have always been a music lover, I grew up in a musical family. I started DJing when I realized I had an ear for picking out hits or songs that can do well in the industry. 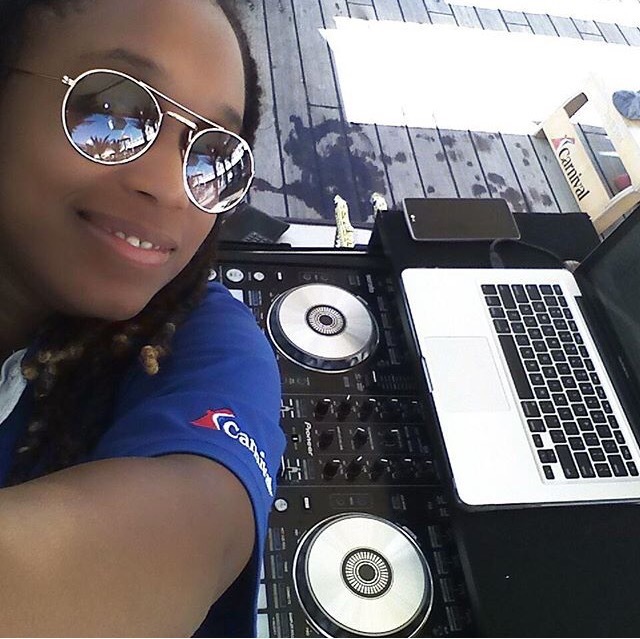 I was always interested in DJs at a young age like DJ Spinderella, Jazzy Jeff, Kid Capri and local radio jockeys. In my sophomore year in college I bought my first turntables and began learning the concepts of DJing. After I realized I had a grip on the art of being a DJ, I changed majors from Music Education to Music Industry. As a female in the industry it is hard. It has been hard for me to work my way into clubs because I’m a female DJ that doesn’t dress provocatively to get in good with club owners and promoters. I’m just a girl who is a dope DJ. Of course you have the guys that try to come at you in non professional ways and once that happens I don’t deal with those clubs anymore. As a female I feel I have to prove myself even more because we are usually overlooked. I have to go harder than the guys. I often get a “look” or talked over by older men when it comes to talking about sound and DJing. They think I don’t know technicals or simple stuff because I’m a woman, but when I open my mouth and talk, they look stupid and say, “Oh…you know what you’re doing”. I was blessed to have two club owners that gave me a shot to DJ at their clubs. I went in and “kilt it”, earning residency at their clubs, Ventura’s Lounge in Shaw, MS and ABG in Tupelo, MS. These club owners were different because they saw me as a DJ and not just a little girl trying to play music. My break to becoming an international DJ came when I took the last of my money I saved and went to Atlantic City for a DJ conference. At the time I was a broke college student that bought a bus ticket, rode 22 hours, paid for a hotel room and had $55 in my pocket to eat off of for 4 days. At the conference I met a guy who heard me playing around with turntables and he talked me into auditioning for a job. I didn’t want to but did it anyway. I used his laptop and controller and auditioned in a room for 4 people including DJ Irie! They loved my audition and didn’t believe I was just a girl from Mississippi. Two days later I had an email offering me a job to work with cruise lines and resorts! “I want to go to church too“, my mother said. 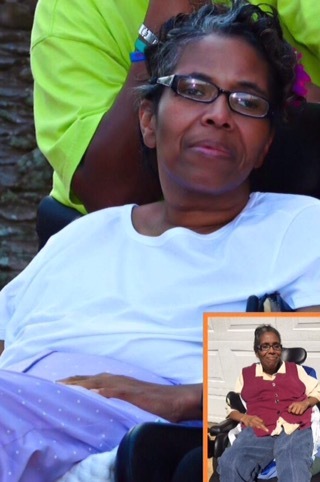 Due to her long 12 year battle with Multiple Sclerosis (MS), Barbara Rainey had lost her ability to use her legs and at times her arms and hands. Multiple Sclerosis is a rare (fewer than 200,000 US cases per year), chronic, typically progressive disease for which there is no cure. It involves damage to the sheaths of nerve cells disrupting communication between the brain and the body causing numbness, impairment of speech and of muscular coordination, blurred vision, and severe fatigue. I started a Go Fund ME page in an effort to help raise funds to purchase a special van that my mom can drive her powered wheelchair into. She has stated she “feels like a prisoner in her own house”, simply because she is unable to leave and travel, even if it’s to go to a much needed Dr.’s appointment. At this time, it takes two people in two different vehicles to take her out away from the house. She has to be lifted and transferred into her van and the wheelchair is lifted into the back of it as well. Once this is done there is no room for the lift to fit into the van. Therefore a second vehicle will have to travel and carry her lift. The idea of a van where she can just drive her chair into would be such a blessing for her and our family. Missing Dr. appointments has taken its toll on Barbara Rainey’s health. Once she was finally able to get to the Doctor, the latest MRI revealed that she had new lesions on her brain. Though it’s been an honor to help raise awareness about women in the DJ industry as well as Multiple Sclerosis, raising awareness is just the first step. I pray this serves as a catalyst for change, an incentive to donate to the cause as well motivation to seize a moment of self reflection. We never know what someone is dealing with. Especially if they are not one to complain. Perhaps you or a loved one is dealing with a chronic illness and there are days you long to tell the whole world. Then there are days when you do scream it on every mountain top while feeling as though you’re on MUTE. Praying you’re unmuted today and even consider…passing the mic. © Ericka Arthur and authenticitee speaks; 2015, 2016. Unauthorized use and/or duplication of this material without express and written permission from this blog’s author and/or owner is strictly prohibited. Excerpts and links may be used, provided that full and clear credit is given to Ericka Arthur and authenticitee with appropriate and specific direction to the original content. Wow, thanks for sharing this. DJ Saxy was our cruise DJ on the Fantasy last year and really went above and beyond with everything she did there. Blessings to her and her mom, and to you for sharing this story. Wow that is fantastic news! I appreciate your sharing & blessings to you as well! FYI, there appears to be an issue with the GoFundMe page that can only be fixed by the organizer. Hello & thank you SO much! I will add an addendum to the post. She is currently at sea and does not have consistent reception and/or WIFI to make the corrections at this time. I will certainly make her aware as well. We communicated briefly today and she is grateful for the support! Hello! DJ Saxy advised the gofundme page issues have been resolved! Blessings! Next Next post: GOOD SUNDAY MORNING…LET’S TALK ABOUT LOVE!